We offer a vast array of commercial and architectural signs. The right sign can make the difference in your business’s success. Whether it is lighted signage, dimensional letters, carved signs, or any other option, the first impression clients often get of your enterprise is your signage. Are you doing all that you can to market your company? The Sign Center excels at helping North Jersey businesses attract new customers and drive sales with vibrant commercial signs. Vehicle Graphics – This is by far the most affordable and attention grabbing way to brand your enterprise as you travel around town in your company vehicle. Site Signs – Also called moveable signs, these markers are the ideal way to let consumers know you have property for sale or lease. 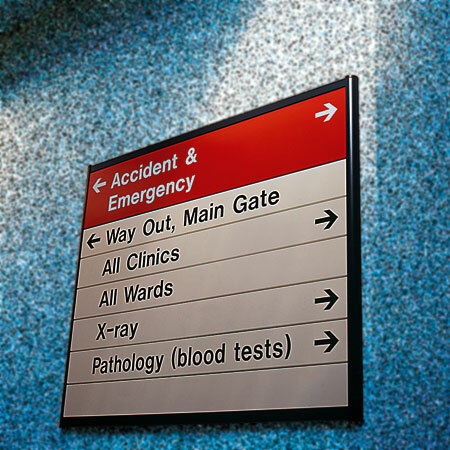 Directional Signage – Commonly referred to as wayfinding systems, these markers offer verbal and visual cues to help visitors navigate throughout your building. Digital Graphics – For your enterprise or a meeting, you have the ability to add color gradients or photos to your trade show booths, banners, display prints, and signs with digital graphics. Lighted Signs – If your business is open after dark, you must consider illuminated signs. With LEDs now more versatile and affordable than ever, you will also save on energy costs. ADA Compliant Signage – As ADA signage professionals, we will help you in bringing your building up to compliance with the Americans with Disabilities Act. Monument Signs – Arguably the most distinguished form of signage, monument signs are a great way to make it easy for customers to find a company within a complex. Framed Aluminum Markers – A flat aluminum panel sign gets an added dimension with frames. This is one of the most long lasting options available. Lobby Signs – Also known as reception area signs, these markers make good use of bland, bare walls while inviting customers in. Carved Signage – We are able to carve many different materials to your liking and finish them with paint of any color, or you can try a gilded or silver look. Awnings – We use Sunbrella fabrics for our awnings, since they come in more than 140 colors and styles. They are also fade resistant and easy to clean. Whatever signage you need, The Sign Center can make it a reality. We can custom tailor any of the above sign types to include your company’s logo and colors in order to match your marketing materials and keep your branding consistent. Plus, as a full service commercial sign company, we take care of every part of the process. We will work with your township to get the right permits, create a design, fabricate your signage, install it, and follow up with maintenance. The Sign Center’s service area covers all of North Jersey. We install, design, maintain, and fabricate signs in Plainfield, Millington, Stirling, Wachung, New Providence, and other communities from our headquarters in Berkeley Heights, New Jersey. For a free quote and consultation on commercial signs, give us a call today.